The F&BKP is an open and independent platform that welcomes organizations and networks operating within the F&BKP’s thematic focus areas as partners. 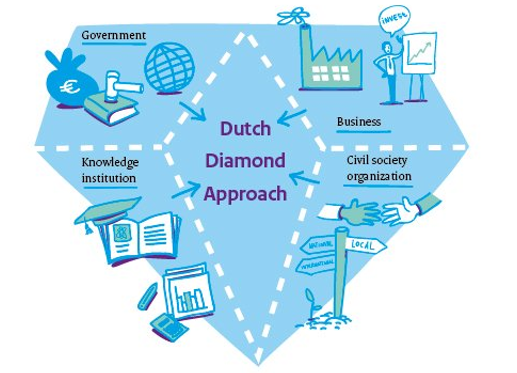 We target organizations and networks that represent the four corners of the Dutch Diamond – private sector, knowledge & research, civil society and government – and their offices in low- and middle-income countries (LMICs). In all its activities, both in the Netherlands and worldwide, the F&BKP encourages multi-stakeholder collaboration and exchange between businesses, knowledge institutions, NGOs and government agencies. A second type of partners are the strategic partnerships between the Dutch Ministries of Economic and Foreign Affairs and the World Bank Group and CGIAR, which the F&BKP facilitates. We are also a partner in YEP Agrofood. To learn more about our partnerships and how your organization can become involved, see Partners. The F&BKP always asks its partners to prove how they work towards achieving tangible local impact in terms of better FNS policy and practice. Those who stand to benefit from better policy and practice are the ultimate beneficiaries of our work: farmers, small and medium-sized businesses and consumers in countries where FNS is at stake for large parts of the population. The F&BKP does not normally work directly with the beneficiaries. We ensure that they are reached through a two-step approach: our Dutch Diamond partners and their offices in LMICs act as an interface to local networks, organizations and businesses, while the latter in turn function as a direct interface to the farmers, local businesses and consumers. In one area of our work, we do relate directly to local organizations and businesses. This is in our collaboration with WOTRO on two research funding instruments. The research consortia that receive funding all include local organizations (knowledge institutions, NGOs and/or businesses) and regional and country meetings organized by WOTRO and the F&BKP also actively involve a wide network of local organizations. Second, in the case of Strategic Partnerships, where the Platform connects with international organizations such as the CGIAR and World Bank Group to reach synergy between them and the F&BKP network at an (inter)national level. Find more inforation on the facilitation of Dutch strategic partnerships with the World Bank Group and CGIAR and the F&BKP partnership with YEP Agrofood. Find more information on the knowledge activities of networks suported by the F&BKP Office through sharing knowledge, co-creating knowledge, deepening existing knowledge and translating knowledge into policy and practice.